The Project Coodinator of the Hydrocarbon Pollution Remediation Project (HYPREP), Dr. Marvin Dekil has raised alarm over the activities of illegal artisanal refineries in the area. Dekil who briefed State House correspondents in Abuja on the activities of the HYPREP in Ogoniland , last Friday said the activities of the illegal and artisanal oil refiners had constituted a source of worry to the Ogoni clean-up project. Nigeria’s oil producing states, especially Ogoni-land are dotted with illegal artisanal oil refineries with attendant economic, environmental and social consequences for the country. The artisanal refiners, who are mainly drawn from the Ogoni extraction had in August met with the Minister of State for Environment and Chairman, Governing Council, HYPREP, Ibrahim Jibrin, in Port Harcourt, at a one-day consultative meeting organised by the office of the project coordinator of the HYPREP. 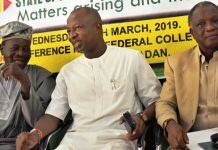 During the meeting, the artisanal refiners through their spokesman, Mr. Domka Humphrey said they could only stop refining petroleum products illegally if the Federal Government would empower them as well as include them in the remediation process in Ogoni-land. He said: “Sir, I will tell you our minds, if you don’t empower us, we will not stop refining, because this is what we feed our families and relations with. We don’t have anything doing after government took away pipeline surveillance from us”. So, we need to be carried along. Some of us are graduates, many people are still in the bush refining, if you empower us, we will talk to them and they will leave the bush. But where we are not seeing anything, it will be very difficult for us to leave the illegal refining”. However, Dekil disclosed that HYPREP had started engaging with the artisanal oil refiners with a view to checking the menace of their activities in the area. “We are also in the process of engaging with the ex-artisanal refiners. This is another key aspect of our activities. “It is important that the artisanal refining activities in the area is stopped because it’s a source of worry after clean-up. “It will make no sense if we were to spend this amount of money, one billion dollars, to remediate sites only to have these places polluted again. “So, we needed to engage with the artisanal refiners. The Minister of State for Environment, three weeks ago, on the invitation of HYPREP, came to Port Harcourt and met with a cross section of the people. “They agreed to key into the project and stop all such illegal activities. “They also added that they would like an alternative training for themselves”, he added. The coordinator revealed that HYPREP would soon be conducting a workshop for the artisanal refiners so as to come up with the most appropriate training programmes for them. Dekil disclosed that HYPREP had successfully created eight remediation active sites carrying out demonstration projects across four local government areas of Ogoni-land.